Mike Scaccia, the brilliant guitarist of Rigor Mortis and later, Ministry, has died. 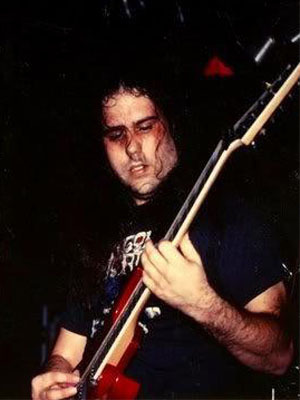 He collapsed onstage December 22, 2012 while performing with Rigor Mortis and could not be revived. He is survived by a wife and children, and much excellent music. What made Scaccia’s playing distinctive was his sense of melody, finely-tuned strumming and tendency to use more than low crunchy notes, as well as an ear for a quality riff and an ability to use precise arrangement to let a song unfold to the greatest impact on the listener. No one wants to type words like this. This is a tragic loss for metal, for music and for humanity. Scaccia was not only a killer shredder, but widely acclaimed as a decent human being. He inspired many of us with his literate but emotionally intense music. That music survives him and will serve as not only his legacy but the best insight into his character. What do you hear in this music? Darkness, beauty, equilibrium and violence. Like the man himself, more complex than a few paragraphs can do justice to, but also based of a fundamentally life-affirming but realistic outlook on existence. It’s events like this that make me hope there is a Valhalla or reasonable equivalent. The body can die, but the greatness of a musical hero lives on long after the dirt obscures the coffin. We’ll be thinking of you, Mike, and the family and bandmates you left behind, with today’s all-Scaccia playlist. I JUST LOST MY LIL’ BROTHER AND MY BEST FRIEND – THE 13TH PLANET COMPOUND IS DEVASTATED,COMPLETELY IN SHOCK AND SHATTERED. MIKEY WAS NOT ONLY THE BEST GUITAR PLAYER IN THE HISTORY OF MUSIC, BUT HE WAS A CLOSE, CLOSE, CLOSE PART OF OUR FAMILY – AND I JUST LOST A HUGE CHUNK OF MY HEART TODAY. OUR LIVES ARE FOREVER CHANGED. LIFE WITHOUT MIKEY IS LIKE ORANGE JUICE WITHOUT PULP – KIND OF BLAND. I HAVE NO WORDS TO EXPRESS WHAT THIS GUY MEANT TO ME, MY FAMILY, MY CAREER….EVERYTHING! GET TO KNOW HIS LEAD PARTS – FOR THEY ARE IN THE PANTHEON OF MUSIC! UNFORTUNATELY, MOST OF YOU DIDN’T GET TO KNOW MIKEY’S SOUL -WHICH IS IN THE PANTHEON OF HUMANITY. HE IS MY HERO, MY FRIEND AND MY IDOL. MIKEY WAS ALWAYS BESIDE ME – MY RIGHT HAND MAN – THROUGH THICK AND THIN, THE GOOD, THE BAD, THE UGLY AND THE BEAUTIFUL.